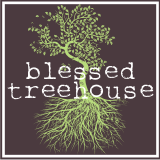 Blessed Treehouse: So what does he think of her? Now that I have two children, people frequently ask me, "What does Henry think of Harper?" And my simple response is usually, "He really doesn't mind her." After a minute of pointing and gently poking, Henry usually wanders off as Harper is clearly less exciting than climbing in the toy box. Though he doesn't mind Harper, he LOVES her baby gear. Several times a day I will find Henry playing with her swing - pressing the buttons and pushing the chair. Additionally, he spends a lot of time with her bouncy seat. It also has buttons for pushing, and occasionally he will store toys in the cupped seat. But just today I witnessed a new phenomenon that doesn't necessarily come with having two children, rather it comes with having a son. As Harper slept beautifully and peacefully in her seat, Henry took his Matchbox car and ran it over her swaddled lil' body. I watched, a bit shocked that he just turned his baby sister into a racetrack. I must give him props for creativity. There is no doubt that this boy has one heck of an imagination. And he is ALL boy. I'm simply praying that he doesn't use her as a pounding surface as his latest obsession is taking his play golf club and whacking the walls, tables, and anything else that stands in his way. She'll survive all the whacking. Too cute!! Oh my gosh....can't stand the cuteness!!! How precious are they? LOVE that pic! You can really see the curiousity in Henry's eyes. And one day, Harper is going to want a copy of this picture to frame to remind her of how her big brother watched over her. Just beautiful! Our 17-month old gets cuddled by her big sister and wrestled with by her big brother. Boys and girls are so different, but so fun! LOVE it! Yep, total boy thing! They can turn anything into a race track. So, fun that he is curious about her. Love you bunches! I can't get enough of your blog these days. It always makes me smile (except for the one about you being sick... how are you feeling now?)! I love that picture!! He's gonna be a very good big brother.